WASHINGTON (AP) — Picking up the pieces after a contentious nomination battle, the Senate's majority leader said Sunday that the chamber won't be irreparably damaged by the wrenching debate over sexual misconduct that has swirled around new Supreme Court Justice Brett Kavanaugh. Senate Majority Leader Mitch McConnell is signaling that a Republican-controlled Senate would act on President Donald Trump's nominee to the Supreme Court in 2020, a presidential election year, should a vacancy arise. WASHINGTON (AP) — The federal appeals court for the District of Columbia has voted to livestream the audio of all oral arguments, except when classified or sealed material has to be discussed. President Trump jokingly thanked predecessor Barack Obama on Thursday for leaving more than 100 federal judicial vacancies for him to fill. "I don't know why Obama left that. It was like a big, beautiful present to all of us. Why the hell did he leave that?" Mr. Trump said while giving a speech on America's infrastructure in Ohio. Mr. Trump suggested Mr. Obama got complacent in not filling the vacancies. The consideration of Andrew J. McDonald to become Connecticut’s chief justice put the confirmation process on trial. LANCASTER, Pa. (AP) — Chief Justice John Roberts told a gathering of lawyers and judges on Friday that pop culture references can be the perfect way to make a legal point, but they carry some risk. To the Republicans who claim rhetoric on the left triggered the shooter (“Rifle-wielding attacker wounds GOP leader, killed by police,” June 15), I’d like to answer: Why is Merrick Garland not our Supreme Court justice? What are you doing to our immigrant neighbors? What are you doing to our health care? Why aren’t you helping us clean up our planet? Why are you trying to privatize our infrastructure? We see what you are doing, and we are furious. WASHINGTON (AP) — A longtime friend of Judge Merrick Garland tells The Associated Press that Garland is happy in his job and has no interest in leaving the judiciary to head the FBI. The comment came Tuesday after Senate Majority Leader Mitch McConnell said he recommended that President Donald Trump nominate the federal appeals court judge for the post. The friend spoke on condition of anonymity to discuss private conversations. The days of our republic are numbered. We are on a fast track to dissolution. Who knows when it began. Was it when the Supreme Court incorrectly bestowed personhood on corporations? Was it when the Supreme Court ruled money is free speech? Or was it when Senate Majority Leader Mitch McConnell, R-Kentucky, decided preserving the tenuous grip that conservatives have on the Supreme Court was more important than the Constitution itself? JACKSON, Miss. (AP) — Sen. Roger Wicker of Mississippi is praising fellow Republicans for blocking Democrats' ability to filibuster judicial nominations — a move that led to confirmation of Neal Gorsuch to the U.S. Supreme Court. TROY, N.Y. (AP) — The "partisan hostility" surrounding the confirmation of Justice Neil Gorsuch is of concern because it could undermine public confidence in the apolitical nature of the judicial system, U.S. Supreme Court Chief Justice John Roberts said Tuesday at a college appearance in upstate New York. Democrats are more energized now than they have been since the Vietnam War. Democrats have a chance to make real inroads in the Republican control of Congress and statehouses throughout the country in the 2018 election. But if Democratic leaders fail to fight with every ounce of strength to prevent the destructive Republican policies, Democratic voters are likely to once again sit home, and the chance to change the direction of this country may be lost for a generation. Judge Neil Gorsuch would never have been appointed to the Supreme Court by Hillary Clinton. He's way too conservative. But unfortunately for those of us who would prefer a more liberal choice - such as Merrick Garland, who never got a confirmation vote - Hillary Clinton didn't win the election. Donald Trump did. And that means he gets to appoint someone who agrees with him to the Supreme Court, not someone who agrees with me and my Democratic friends. WASHINGTON - If you think there isn't enough extremism in American politics, this week's for you. If all goes as expected, the week will conclude with the confirmation of Neil Gorsuch as a Supreme Court justice. This outcome is lamentable. The seat was President Barack Obama's to fill, and Merrick Garland's to occupy. But as conservative as Gorsuch will likely turn out to be - belying his disingenuous claim that there is "no such thing" as Republican or Democratic judges - that's not the problem. A Senate showdown is at hand over President Donald Trump's Supreme Court nominee, and it could change the Senate and the court for years to come. Democrats escalated their attacks against Judge Neil Gorsuch ahead of key votes set for Thursday, portraying him as an ally of the powerful and an enemy of the weak. Republicans defended him, accusing Democrats of trying to block Gorsuch out of frustration over Trump's election victory. FARGO, N.D. (AP) — Left-leaning voters in North Dakota are grappling with Democratic Sen. Heidi Heitkamp's support of President Donald Trump's Supreme Court nominee, with some of them tempering disappointment with an acknowledgement of her looming re-election fight in a conservative state. Longtime Democrat Willy Kirschner, a Fargo attorney, said he believes Heitkamp is too supportive of Republican policies and her backing of nominee Neil Gorsuch is too much for him to take. 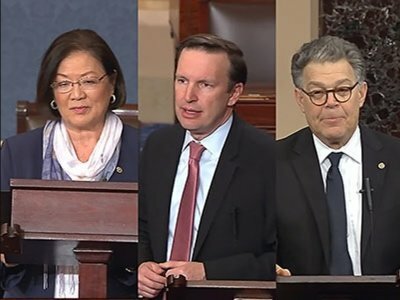 WASHINGTON (AP) — Senate Democrats elevated their attacks against President Donald Trump's Supreme Court nominee Wednesday, portraying him as an ally of the powerful and an enemy of the weak as an explosive showdown loomed on the Senate floor. Republicans defended Judge Neil Gorsuch, accusing Democrats of trying to block him out of frustration over Trump's election victory. As the U.S. Senate clashes over the confirmation of President Donald Trump’s pick for the Supreme Court, New Mexico’s senior senator says he is still open to an improbable compromise. What a disgrace! By any rational standard Judge Neil Gorsuch — who was unanimously confirmed for his appeals court post — is a first-rate choice for the U.S. Supreme Court. He is a man well-suited by virtue of his experience and his temperament to sit on the nation’s highest court. The nomination process of Neil Gorsuch to serve a lifetime appointment on the U.S. Supreme Court is coming to its conclusion. Democrats are threatening to filibuster Judge Neil Gorsuch’s confirmation as a U.S. Supreme Court justice. They shouldn’t. We understand; Senate Republicans unjustly blocked President Barack Obama’s nomination of Judge Merrick Garland to the vacancy created by the death of Justice Antonin Scalia in February 2016. The president nominated the highly qualified Garland the next month, and the Republicans — with amajority in the Senate — denied him even a hearing. WASHINGTON — Senate Republicans and Democrats are waging competing public relations wars surrounding efforts to confirm Neil Gorsuch to the U.S. Supreme Court. For the GOP, in the lead-up to next week's floor debate and ultimate confirmation vote, there might be no better spokesman than U.S. Sen. Lindsey Graham, R-S.C. Note to Democrats: Spare us the lectures about doing the right thing. And while you're at it, don't bother finger-wagging at us about some faux concerns you have. And don't even think of uttering the name Merrick Garland. Democrats just can’t get out of their own way on the pending nomination of Judge Neil Gorsuch to the U.S. Supreme Court. They desperately need a reason to oppose him — because, well, just because. He’s a brilliant legal scholar — Columbia, Harvard Law, Oxford — with more than a decade of experience on the federal appeals court and several books to his credit. Well, he’s President Trump’s nominee. Yes, elections have consequences — something Democrats are still trying to cope with. WASHINGTON (AP) — Thirteen months after the death of Justice Antonin Scalia, the Senate is finally holding confirmation hearings to fill the vacancy, considering President Donald Trump's choice of Neil Gorsuch for the high court. I’m not sure who decided that the Democratic critique of U.S. Supreme Court nominee Judge Neil Gorsuch would be that he doesn’t side with the little guy. It’s a truly terrible idea. Like other liberals, I’m still shocked and upset that Judge Merrick Garland never got the vote he deserved after his nomination by President Barack Obama, and I’d rather have a progressive justice join the court. In regard to Russell Fagg’s column in the March 3 Gazette endorsing Neil Gorsuch, it’s important to note that although his entry is entitled, “Ask the judge” it should be made very clear that Fagg’s submissions are simply opinions. It’s so incredibly interesting to me that Russell Fagg drones on about the credentials of nominee Gorsuch without even mentioning the nomination of Merrick Garland by Obama. SALT LAKE CITY (AP) — Utah Sen. Orrin Hatch says Supreme Court nominee Neil Gorsuch is one of the best judges in the country and will protect religious liberties is he's confirmed to the high court. Hatch, a Republican, spoke to Utah's state Senate on Wednesday about Gorsuch, a Denver-based 10th U.S. Circuit Court of Appeals judge. The senator says the most important issue to consider in the 2016 presidential election was filling a vacancy on the Supreme Court. MADISON, Wis. (AP) — Gov. Scott Walker took more jabs at Democratic Sen. Tammy Baldwin on Wednesday, calling for her and the U.S. Senate to take a vote on President Donald Trump's nominee for the Supreme Court. Walker was joined by fellow Republican Attorney General Brad Schimel at the Capitol news conference that was part of a coordinated 11-state effort organized by the conservative group the Judicial Crisis Network. WASHINGTON (AP) — In daily visits to Senate offices, Supreme Court nominee Neil Gorsuch has tried to make clear to Democrats that he's an independent thinker. It gets downright depressing to see conservatives and liberals, Republicans and Democrats, oiling their guns, sharpening their knives and starting to circle each other in a modern-day version of the legendary gunfight at the OK Corral. PORTLAND, Maine (AP) — Maine Sen. Susan Collins is going to meet with President Donald Trump's nominee to the U.S. Supreme Court. Collins is scheduled to meet with Judge Neil Gorsuch at 10:15 a.m. Thursday in Washington. There is a vacancy on the high court following the death of Justice Antonin Scalia last year. With President Trump's nomination of Coloradan Neil Gorsuch to fill the vacancy on the U.S. Supreme Court, all eyes turn to Senate Democrats. Will they or won't they play hardball? They could refuse to allow hearings or a vote on Gorsuch, much the same way Republicans refused to consider then-President Barack Obama's pick, Merrick Garland.